From Australia to Tel Aviv, the dark aftermath of the Orlando shooting is being lit up with the colors of the rainbow, as worldwide landmarks express solidarity with the victims. Fifty people were killed, including the shooter, at the Pulse gay nightclub in Orlando in the early hours of Sunday. Since then, acts of solidarity have been taking place across the globe. The shooting has affected the lives of people as far away as Australia and New Zealand. In the New Zealand city of Wellington, the Michael Fowler Centre – a concert venue and convention hall – also illuminated the outside of the premises. The picturesque Sydney Harbor Bridge in Australia was also adorned in rainbow lights. Sydney's town hall took a different approach, with the building illumined in pink to mourn the loss of the victims. It also flew a rainbow flag at half-mast. Further south, the Australian city of Melbourne joined in the movement, lighting up its town hall. The city's Arts Centre also dazzled with changing colors of the rainbow. The city of Brisbane made its bridge more colorful. Meanwhile, in Adelaide the Adelaide Oval sporting venue was brightly lit. In Israel, Tel Aviv's city hall shone bright with rainbow colors, a symbol known across the globe to be associated with the LGBT community. 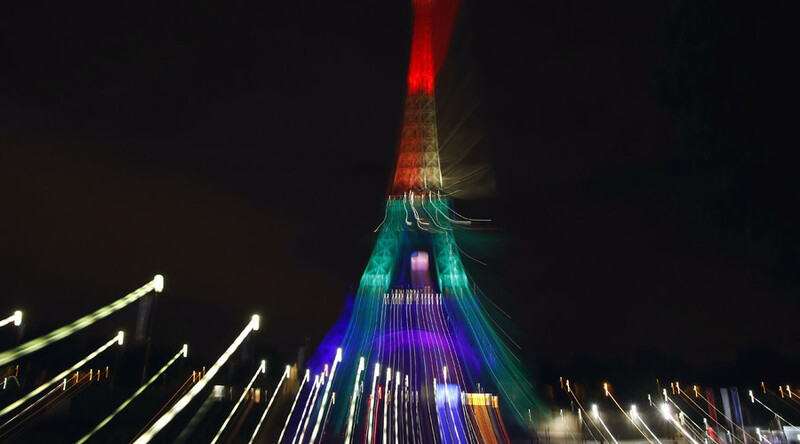 The Eiffel Tower also stood proud underneath colorful lights, mimicking a gesture that so many cities expressed after the November terror attacks in Paris. Toronto, Canada, illuminated its famous sign in multi-colored lights. Closer to the scene of the tragedy, cities across the US also joined in. In New York, the spire of the One World Trade Center sparkled above lower Manhattan. New York City Hall did the same. The Empire State Building took the opposite approach, choosing to go dark to mourn the victims. In Boston, the TD Garden – home to the Boston Bruins professional ice hockey team – was also lit up. In Cincinnati, the Duke Energy Center spelled out the city's name in rainbow lights. The Bond Bridge in Kansas City, Missouri, also shimmered in beautiful colors, as well as the Union Station exhibition venue. In Minneapolis, Minnesota, a bridge over Interstate 35-W got the luster treatment. In the country music capital of Nashville, Tennessee, the Davidson County Courthouse also expressed solidarity. The city's Gateway Bridge and Omni Hotel also showed their support. The Omni Hotel did the same in Dallas, Texas. The interstate in El Paso, Texas, also received a burst of light. On the West Coast, the top of the circular US Bank Tower was lit in rainbow lights in Los Angeles. San Francisco City Hall did the same. And in Orlando, the scene of the violent crime, the Orlando Eye ferris wheel shone radiantly. Pulse’s Facebook page is making a special effort to thank the cities involved in the solidarity campaign. The Sunday massacre was the worst mass shooting ever to take place on US soil.